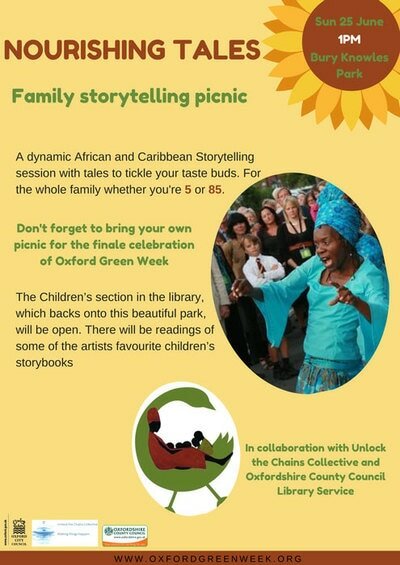 For Oxford Green Week, a family storytelling picnic at Bury Knowle Park, on Sunday 25th June from 1pm. The dynamic African and Caribbean storytelling session has tales to tickle your taste buds for the whole family whether you're 5 or 85. The children's section in the library, which backs onto this beautiful park will be open. There will be readings of some of the artists' favourite children's storybooks. Produced in collaboration with Oxford City Council and Oxfordshire County Library Services.